On 22 November I gave a workshop at Putney Park School in south west London. It was a fascinating day speaking to children ranging in age from six to fourteen. 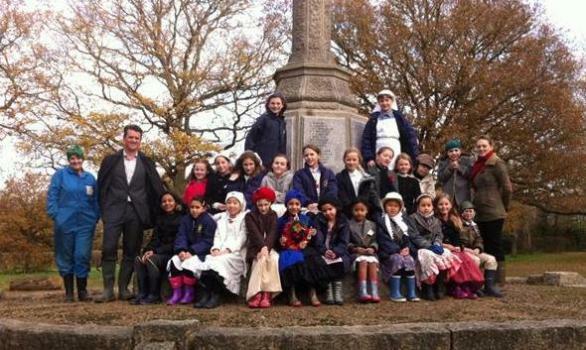 The morning was devoted to Juniors who had got into the swing of things by dressing in Great War era clothes for the day. One girl was wearing a genuine nurse’s outfit from the time. The day started with an hour’s talk on what it was like to be an infantry soldier, why men enlisted and how they did so, information on their training and then an hour-by-hour breakdown of a typical 24 hour period spent in the trenches. After a tea break we boarded a coach that took us to the nearby Richardson Evans Memorial Playing Fields War Memorial, situated in a five-acre area of landscaped ground. It commemorates men with Putney and Wimbledon connections; in consequence the memorial has many names. The children looked at these and I pointed out men with decorations (three Victoria Cross recipients alone) and those with the same surname; sadly the memorial contains many sets of brothers. The trip was based on trying to encourage the children to see not just a list of names but that every individual had a story whose death had left a loved one heartbroken and bereft. After laying a specially (and rather lovingly) crafted wreath followed by a minutes silence and the Exhortation we returned to school. I was then able to provide details on some of the men listed on the memorial including Zeebrugge Raid hero, Lt Commander Arthur Harrison VC. I had found one local family, the Nottingham’s, who had lost three brothers in the space of a year. Interestingly, each brother had fought in a different unit or service. I traced the family back to the 1881 census and was able to show how the family moved around and grew – there were seven children in total – before the war claimed the lives of three. The first to be killed was Leslie, a Gunner in the Royal Marine Artillery who was serving on HMS Queen Mary when it was lost at Jutland on 31 May 1916. The next boy lost was Arthur, a Sergeant in the 3rd Battalion Canadian Infantry. He had emigrated to Canada before the war in search of work and, like so many other British in Canada at the start of war, had enlisted in the Canadian Army. He was badly wounded on the Somme on 9 September and two weeks later succumbed to his wounds, being buried in Wandsworth (Earlsfield) Cemetery. The final boy to die was Ernest, the eldest of the family and a decorated sergeant in the Civil Service Rifles. He was killed on 10 June 1917. Using archival material I was able to show details of the brother’s service and, where possible, mention of them by name in battalion war diaries. I finished my talk by speaking about Private Alfred Whittle, 10th Battalion Sherwood Foresters who was killed outside Ypres just after Christmas 1915. 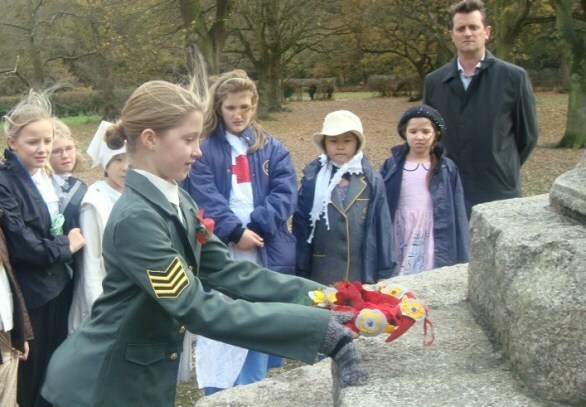 What made him special to the children was the fact that the CWGC recorded his daughter Alice lived at 7, Woodborough Road in Putney – part of what is now the school complex. I hoped that by picking specific names and elaborating on their story the children would realise that the list of names were once living, breathing human beings with families that loved them and mourned their passing. 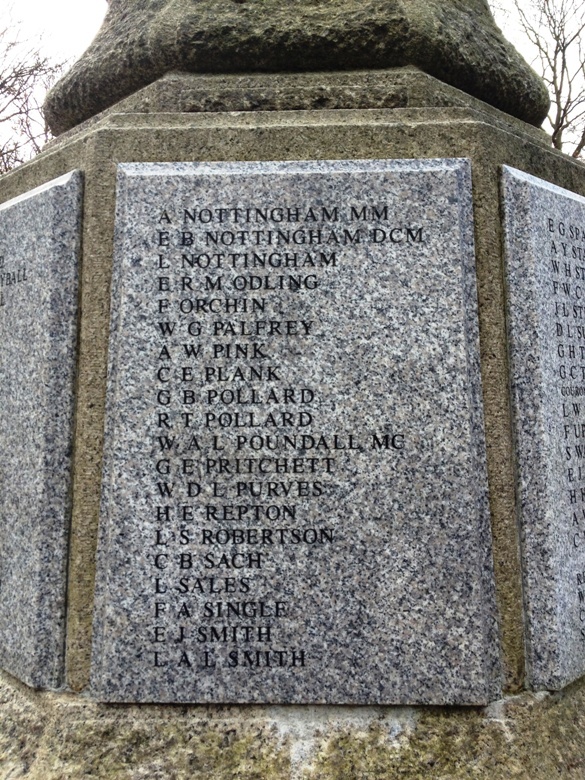 The three 'Nottingham' brothers on the Richardson Evans Memorial Playing Fields War Memorial. Arthur, Ernest & Leslie all died within a year of each other. After lunch I spoke to Year 1 children about the census and what sort of things are recorded before finishing off with an hour’s lecture to Year 9 students on the life of an infantry soldier. My thanks to Mrs Wright for arranging the day, staff members for their welcome and the children for their enthusiasm and interest. “Jeremy’s knowledge, professionalism, charisma and palpable enthusiasm for everything to do with World War 1 not only brought the topic alive for my students but changed the lives of many of us. In such a short time we fully understood trench warfare and the impact on families and nations. From the first time I made contact with Jeremy he responded quickly to my queries, offered fantastic ideas and prepared very well for the day. I simply would not teach the topic again without him.